Shibani Joshi is a reporter for the Fox Business Network. Joshi holds an MBA from Harvard Business School and completed the investment banking analyst program at Morgan Stanley. She also earned a bachelor's degree in finance and accounting at the University of Oklahoma. Joshi is a native of Oklahoma City. 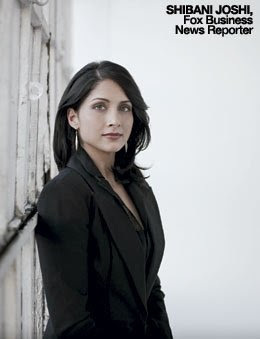 She is married to Rahul Advani, a principal for energy investments at Energy Capital Partners in Short Hills, New Jersey. Advani is a rising star in the energy infrastructure investing space. Many people think that this New York power couple by way of Oklahoma and Maryland could become America's first family of investing. Quite an accomplishment for two children of first generation immigrants ... the "American Dream".